The DMC ensures that dikes remain stable. 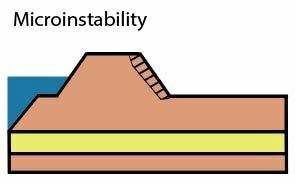 The stability of a dike can be threatened in three ways: macroinstability, microinstability and piping. The DMC takes action even before any of these mechanisms can threaten the stability of the dike. The DMC pumps the excess water out of the dike. This is the cause of almost all forms of instability. 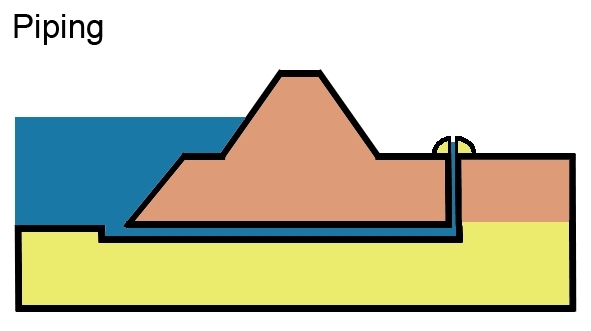 Macroinstability: large clay and soil layers can shift away from the dike, on the land or water side. This could be due to high water or a high groundwater level in the dike (phreatic water level), for example. 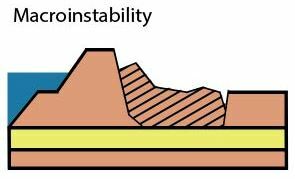 Microinstability: the dike crumbles due to pieces of clay and soil coming loose. 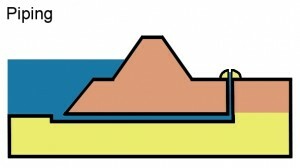 Piping: the dike could collapse because water channels develop under the dike. The flow in the direction of the seepage ditch washes sand with it, making the dike unstable. The DMC sensors detect the threat of macroinstability, microinstability and piping based on pressure changes in the dike. The pressure in the dike is a very reliable indicator of its stability. The system begins to pump when a pre-determined measurement value is reached. Or it sends a signal to the dike managers. The signal values are determined on the basis of geotechnical analysis, for example.